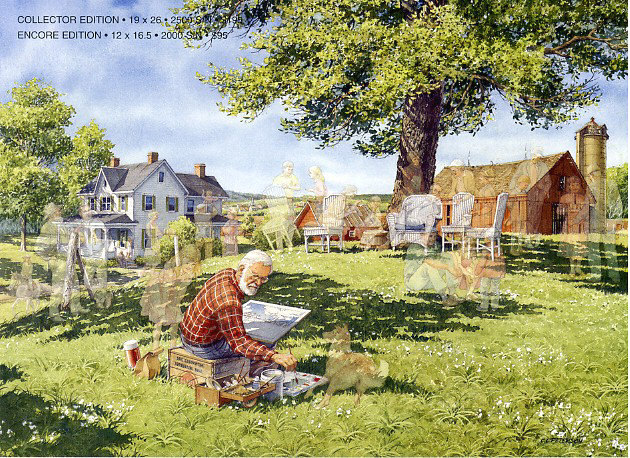 It was 16 years ago that " Sunday Hitch " first introduced Charles Peterson and his unique " memory " paintings to a national audience. A Painter's Memories, our 60th release, completes one of the most popular print series ever published. Here we find Charles Peterson in the process of painting this very scene, still pondering what activities may have accompanied these curiously placed, hilltop chairs. Familiar faces (all from previous paintings) provide the answer, having gathered there in his thoughts for this final reunion...this final " memory " of The Memories Collection.